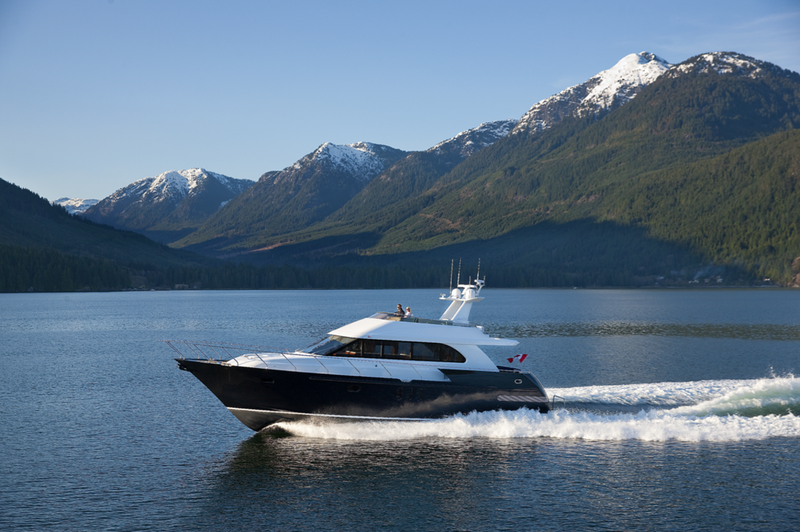 I gotta say—Coastal Craft president Jeff Rhodes and naval architect Gregory C. Marshall put some serious thought into the design of the lower helm station of the Coastal Craft 65 Concord. 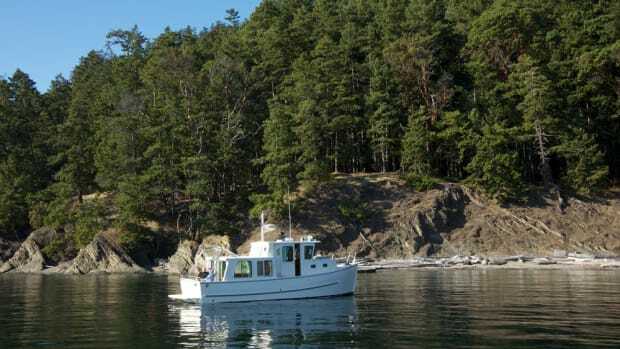 As Rhodes and I sped across the flat-calm waters of Howe Sound, not far from Coastal Craft’s home port of Gibsons, British Columbia, I felt like I was drivin’ a big, broad-shouldered, bluewater-capable, all-aluminum motoryacht while kicked back in the cushy comfort of a Herman Miller Eames Chair, ottoman included. 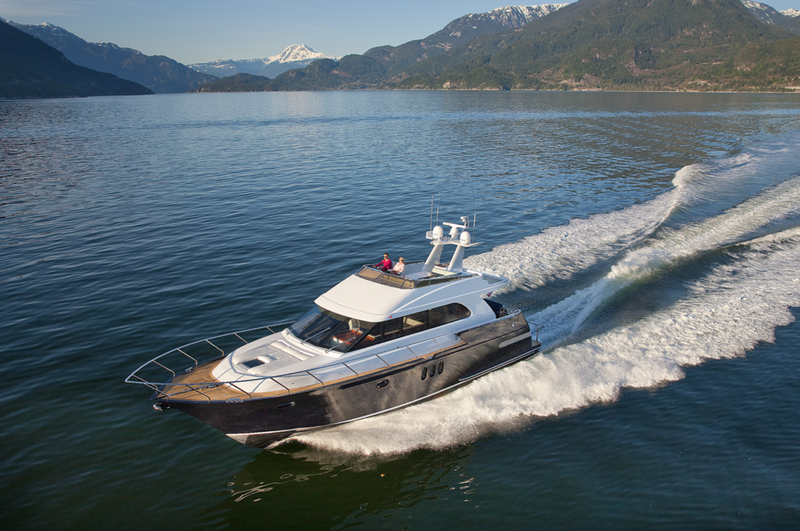 The 65&apos;s ergonomics truly elevate this boats comfort level when underway. Ergonomics were partially responsible. The sweetly contoured, topstitched leather Stidd helmseat I was sitting in had been precisely installed and perfectly adjusted height-wise to produce superb sightlines over the bow throughout the rpm register. And then there was all that wraparound safety glass—the sightlines I was enjoying were superb, not only straight ahead through the three windshield panels but side to side as well. And finally, the fold-up, rubber-clad Stidd footrest under my sock-clad feet was secured in such a way as to produce a very satisfying, relaxing feeling for all the senses. But here’s the kicker: Instead of having to stand up or even lean forward to steer, I was eased way back in the Stidd, letting the fingers of my right hand run the whole show, thanks to what I’d at first taken for an average run-of-the-mill Volvo Penta joystick, mounted quite conveniently—if somewhat unusually—at the end of the underlying armrest. Appearances can be deceiving, of course. And although the stick governed the activity of our IPS1200 pod drives in ways that are now pretty familiar to most boaters, it also served as a jog-type steering lever—all I had to do was tilt right or left to effect a turn, the sharpness of said turn being directly proportional to the amount of tilt applied. But what was even wilder, the stick offered a new, super-simple, super-fast autopilot function as well. The tracking engendered was excellent, but making a heading change? I could simply rotate the stick’s crown, wait for the boat to assume the new course, and let go of the stick. That was it. Mr. Eames? Eat Your Heart Out! 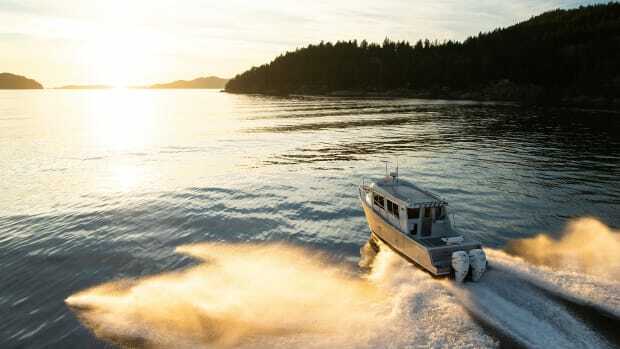 As our test boat settled into a long graceful lope across the rainy sound, with her bow targeting the overcast peaks to the east and her big self-parking Speich pantograph-style windshield wipers swooshing powerfully back and forth, I surveyed my surroundings appreciatively. The dashboard was arranged in a clean, hierarchical, and practical manner. Two easy-to-see-and-touch Garmin GPSMAP 8215 touchscreen multifunction displays comprised the top tier, each flanked by a Garmin VHF 200 handset. Other panels, keypads, and switches were prioritized below. I especially liked the way the inset-type Silva compass was prominently displayed in the midst of things—due to its anti-spin, anti-vibration capabilities, I could read it clearly and constantly, even at a glance. 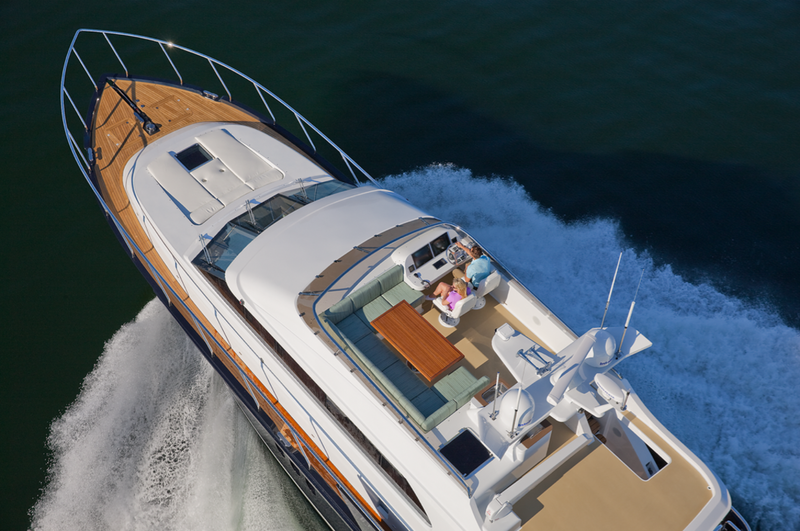 With a top speed over 30 knots, you&apos;ll never miss that happy hour again. Average top speed was 32.6 knots, which felt especially smooth and swift, perhaps because the surface of the water was so darn flat. 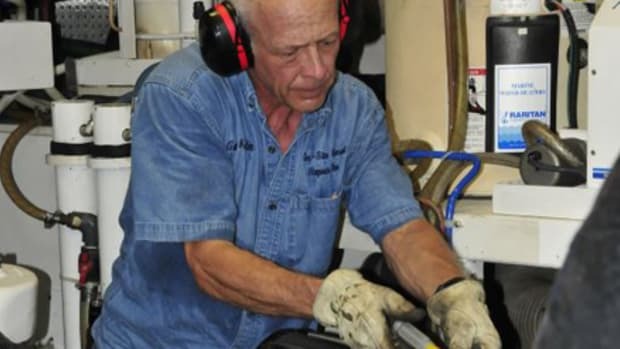 Sound levels were moderate (I measured a max of just 76 decibels at the lower helm), no doubt due in part to the polyurethane foam that Coastal Craft sprays inside various parts of the boat’s aluminum hull—not only does the stuff cut wave-induced noise, it also acts as a thermal/vapor/vibration barrier. And running attitudes were optimum, holding steady at 4 degrees (with no assistance from the Humphree Interceptors) from approximately 1500 rpm all the way up to WOT. Although there were three other joysticks on board (one on the flying bridge and a couple in the cockpit, one to port and the other to starboard), I couldn’t resist the novelty of docking our 65 from the joystick-accoutered Stidd I was so totally enjoying. I began rather playfully, I must admit. Then, with the fingers of my right hand in complete control, my eyes darting forward, aft, and down at the diminishing distance between our test boat’s fenders and the dock, I gently (and with considerable amusement) walked us sideways into a nifty little berth along the shores of lovely Alexandria Island. Mr. Eames? Eat your heart out! When I checked it out, the 65’s engine room was textbook. Overhead surfaces, bulkheads, and walls were sheathed in precision-cut-and-fitted, Soundown sound-insulated white perforated-aluminum paneling. Standing headroom hovered well over 6 feet, the walkway between the Volvo Penta D13s was sufficient (approximately 30 inches wide), and there were thick, sturdy aluminum diamond-plate panels underfoot. Redundancy and safety were priorities, too. Racors for the mains and the genset were duplex and all of them were sea-savvily positioned—I could see every single collection bowl without having to stoop or kneel. Superb. As always, the best room in the house. 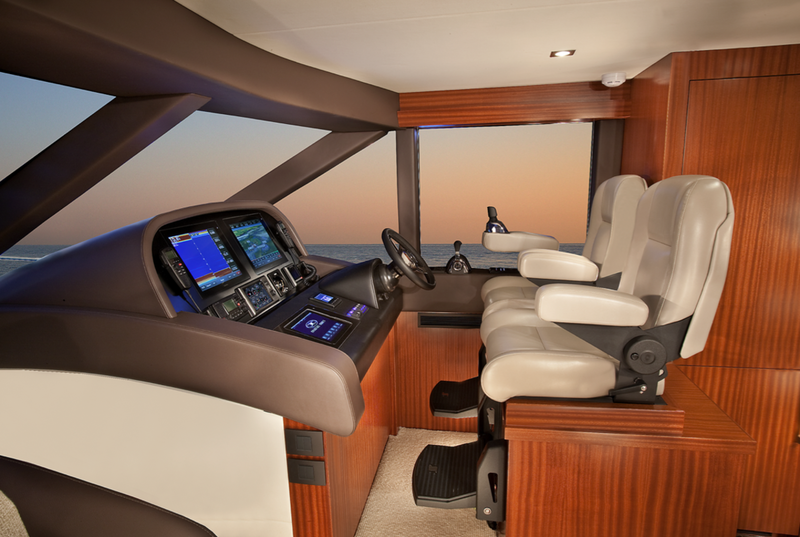 The 65 has a truly exquisitely well designed engine room. I noticed something even neater, though. 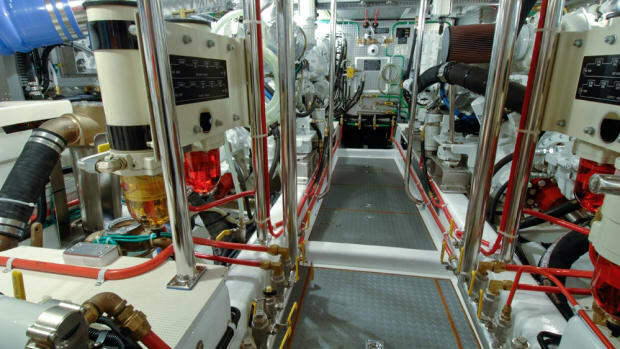 Access to virtually everything in the 65’s engine room—electrics, mechanicals, plumbing runs, you name it—was wholly open and easy, whether for maintenance or repair. Heck, you could stroll around the mains like you were circling a couple of fountains in a park. 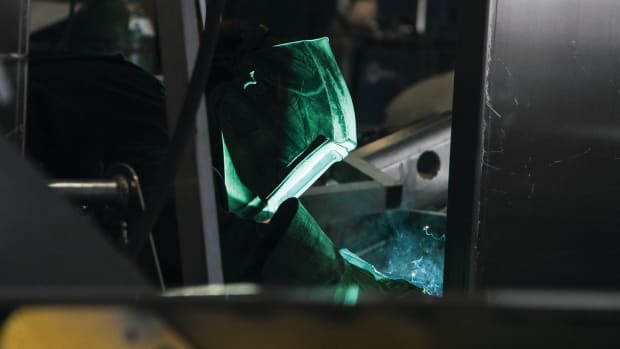 There was no obfuscating, maintenance-nixing structure overhanging the IPS drive units, and the big Groco ARGS-2500-S sea strainers were as well positioned as the Racors—their screw-on lids and sight glasses were hip-high, at the very top of an assembly of stainless-steel piping and beefy hose. 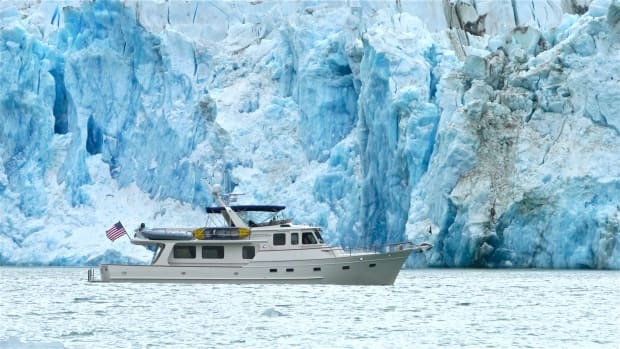 Given her base price of $3,530,000, there’s no question that the 65 is an expensive boat. Indeed, there are offerings on the market in the same size range today that cost much, much less. But once I’d added an interior walkthrough to the attention-grabbing engine room tour I’d just finished, I could see why. The layout was classic, and genuinely roomy. 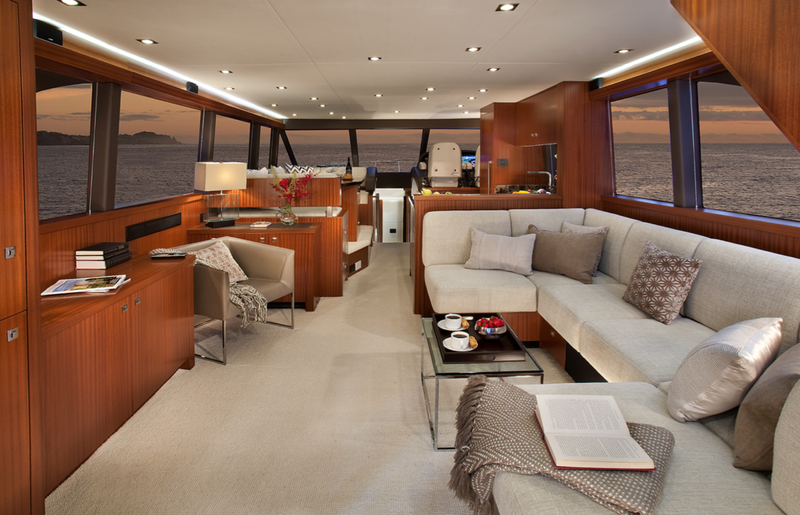 The main deck was given over to a large saloon, with a lounge area aft, dinette to port and forward, and a galley (with Miele appliances) and helm station opposite. 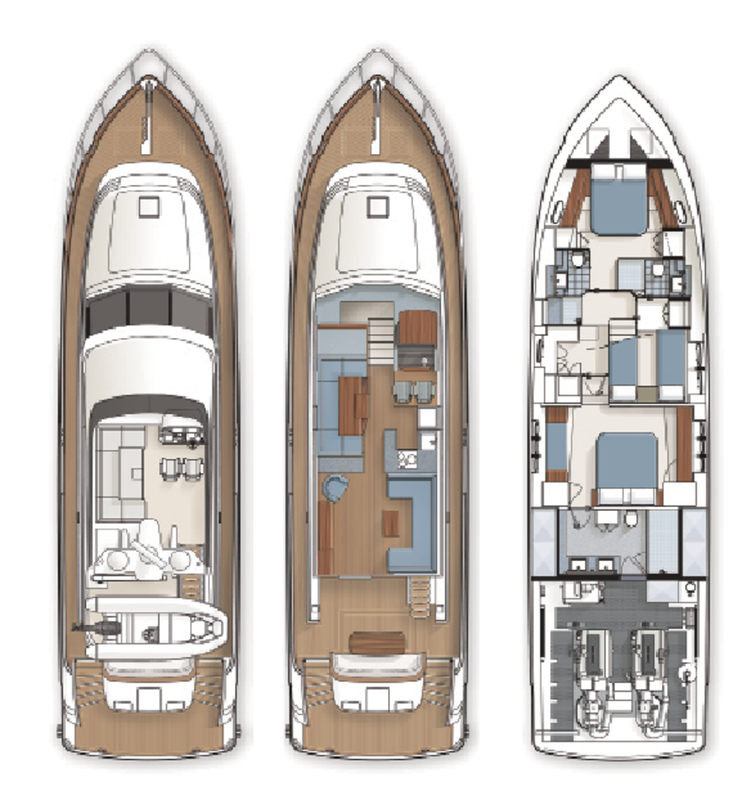 The bottom deck put a big full-beam master aft (with a king berth, large en suite head, and big Manship opening ports); a VIP forward (with queen berth, en-suite head, and Manship hatch); and, in between, a guest stateroom to starboard (with twin berths and an en-suite head), and a utility room (with stacking Miele washer and dryer and optional Viking trash compactor) to port. All this straightforwardness, however, camouflaged some truly remarkable technology, with a multiplexed electrical system leading the charge. 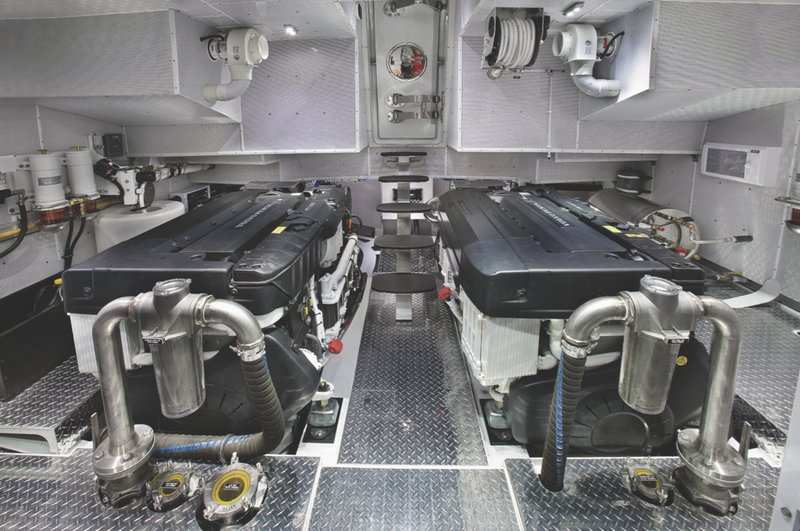 Basically, it integrates a whopping bank of eight high-power (180 Ah apiece) Genasun lithium batteries (four in an equipment room up forward and four more in another under-deck compartment farther aft) with three Victron Energy Quattro inverters, a couple of Victron Energy Skylla battery chargers, a Charles Industries IsoBoost transformer, an E-plex power-distributed monitoring system, and a variety of other sophisticated components. 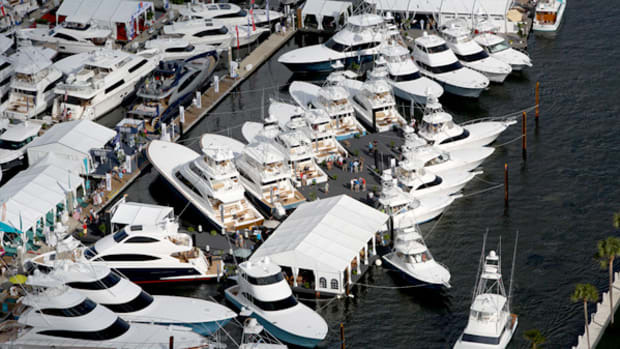 According to Rhodes, not only will this multifaceted mélange allow the 65 to use virtually any type of shore power any time, it will also let an owner repeatedly use all the vessel’s lights, media, and appliances overnight (including air-conditioning in the staterooms) without the generator.